An excellent representation of an early 1900’s era Disston backsaw… and tasty, to boot! 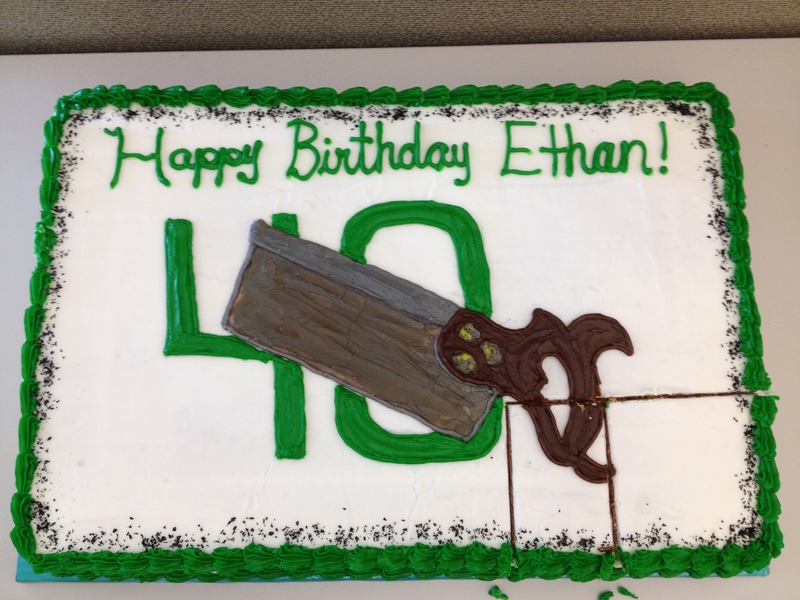 Last Thursday was my birthday; it was a significant one only in that it started with a 4 and ended in a 0. Generally, I’m not a big fan of celebrating my birthday anymore. I’d rather not focus on it now, to be honest with you, but I bring it up because I want to discuss some of the presents I received. As far as in-laws go, mine are pretty good. They’ve embraced me and all of my idiosyncrasies. More importantly, they enable my woodworking habit. And they always seem to know what I want (thankyouverymuch, Amazon and Lee Valley Wish Lists!). So I was pleasantly surprised when I opened a few packages that night to reveal Season One and Season Two of The Woodwright’s Shop on DVD. I remember watching Roy on Saturday afternoons on the local PBS station when I was a kid and I looked forward to watching him again as an adult. But because of a busy schedule over the weekend, I didn’t have a chance to sit down and start watching them until Sunday afternoon, during Finley’s nap. The point of this entry is not to review the DVDs, so I won’t get too much into the episodes I watched except to say that I’m going to have to watch them over a few times to glean all of the information I can. There are some great quotes here and there, if you can catch them, and it’s refreshing to watch someone work live in front of a camera, with no retakes or editing to make it look better. THIS is reality TV to me. By about the start of the fourth episode, Finley woke up from his nap. He and his mom came down and settled into the rocking chair for a few minutes. I decided to go ahead and continue watching Roy, partially because… well, I wanted to keep watching Roy. But also because I wanted to see how Finley would react to it. I have to stop here and explain to you that Finley doesn’t watch normal TV. For the first 18 months of his life, our rule was, “If Finley is awake, the TV is off.” Then we slowly introduced a few things here and there, like Thomas the Tank Engine (complete rubbish, if you ask me; Sir Toppum Hat could increase productivity in his train yard by at least 60% if he fired Thomas and replaced him with a non-speaking engine) and some DVDs of kids’ music and songs. We occasionally watch older cartoons, such as Richard Scarry’s Mother Goose Nursery Rhymes. We’ve tried a few others, like Veggie Tales, but, to be honest with you, he really just doesn’t have much interest in watching TV. He’d rather play. In that aspect alone, I consider myself a successful father. There is one DVD he asks to watch at least once a week. It is Big Easy Express, which is a musical documentary/concert film/road movie about three bands (Mumford & Sons, Edward Sharpe & The Magnetic Zeros, and Old Crow Medicine Show) and their journey from the Bay Area in California all the way to New Orleans via an old passenger train. He calls it “Mumford Red Train” (because one of the cars on the train is bright red) and when we stayed in the hospital for three days in December because he had RSV, it was the only thing he would watch. I’m sure the nurses thought we were horrible parents for making our son watch some music DVD instead of cartoons. I consider this a second aspect in which I am a successful father. St. Roy and that infectious smile! Anyway, back to St. Roy… So Finley does not watch much “normal” TV. He’s never seen a sitcom nor a contemporary cartoon. He’s only ever watched one Disney movie, Cars, and he doesn’t even get 20 minutes into it before he wanders out of the room to play with his own toy cars. I was interested to see what he would do with Roy. To my wife’s surprise (and my extreme pleasure), the second I turned The Woodwright’s Shop back on, Finley stopped what he was doing and started watching Roy. It was the episode with the lathe discussions, so there was lots of moving machinery and big wheels (Finley just said the other day that he loves anything with wheels, so maybe that has something to do with it) and wood flying everywhere. 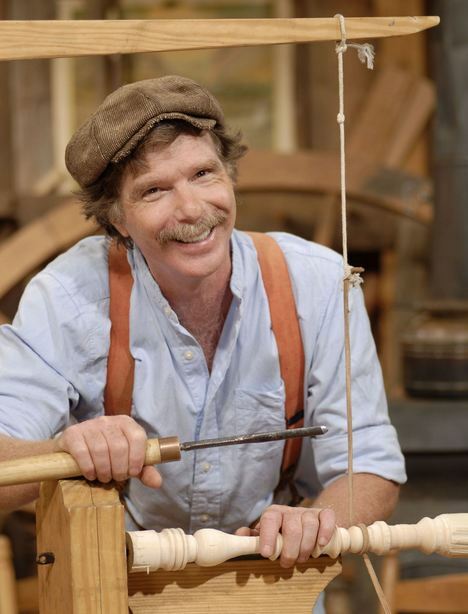 At one point, he was demonstrating other techniques to make things round if you didn’t have a lathe and so he sat at his shaving horse with a drawknife, working a stave of red oak and throwing shavings into his face. He stopped to discuss drawknife techniques (bevel up vs. bevel down) and said (paraphrasing), “I can’t get it to work worth a toot this way, so I always use this kind of drawknife with the bevel down.” I’ll have to keep that in mind the next time I try to rough something out with my drawknife. Well! Isn’t that music to any woodworker’s ears? Your not-quite-three year old asking you to turn Roy Underhill back on! I did and we started watching Roy make a rocking chair. After that episode, I turned it off so we could go for a walk before I got supper started. But I was curious as to what Finley thought about the show. I don’t have to tell you by that point I was envisioning sitting down with Finley every Saturday afternoon to watch the latest episode of The Woodwright’s Shop, do I? Me: So, Finley… did you like watching Roy? Did you like The Woodwright’s Shop? Me: What part did you like best? Finley: He talks about toots. I had no idea what he was talking about. Then it struck me. He was talking about Roy’s description of using the drawknife bevel up or bevel down in the third episode. “I can’t get it to work worth a toot that way.” Somehow he latched on to the only bodily function (aside from bleeding) Roy mentioned, and managed to take it out of context. Got it. OK, so we still have a little ways to go. But the interest is obviously there. 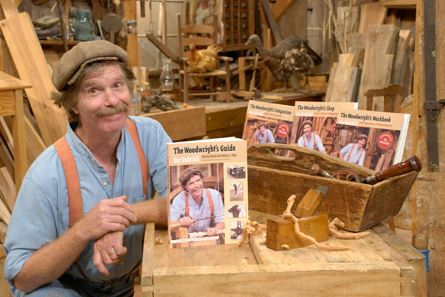 If you’d asked me before yesterday afternoon what I thought my favorite episode or part from The Woodwright’s Shop was, I would have answered Episode One of Season One, because I love the idea behind being self-sufficient, making the things we need, using energy from the sun via the vegetables and fruits we grow and eat to power our muscles. It is fairly close to how I was raised on a farm in small-town Washington, Missouri, now 40 years ago. I’d seen that first episode at some point later in life and his opening message to the start of his 31 year career was so passionately delivered it has stuck with me all this time. Now, though, I’d have to say it is Episode Three of Season One, simply because it’s the first one I watched with my son. If you ask Finley what he likes about Roy’s show, he’ll say it’s because Roy talks about toots. This is SO you and Finley! Love it!